Have a look at what route is closed so you don’t spend too much of the Bank Holiday weekend stuck in traffic. 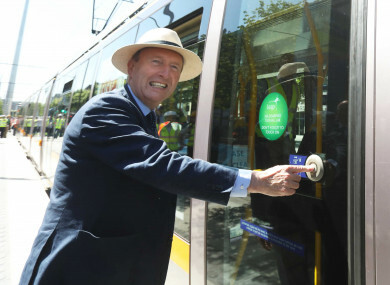 Pictured is Minister for Transport Shane Ross wearing a Bloomsday hat and about to step onto a Luas. IT’S THE BANK Holiday Weekend, which means lots of people will be hopping in their cars for day trips with family and friends. Apart from the usual packed roads into tourist sites and idyllic villages, there are a few more obstacles for drivers this weekend – and some specifically caused by the Luas works in Dublin city centre. Gardaí have warned the public that for the next week and a half there will be severe traffic disruptions to Dublin’s North and South Quays. These will go on from now until 6am on Saturday 12 August at the earliest. Grainne Macken, head of communications for Luas, told RTE Radio One’s Morning Ireland that workers were nearing the final stages of the Luas Cross City development. “In advance of that, there is a very significant piece of the road reconstruction work to be completed over the next number of days. If you’re travelling from the east going westbound, you won’t be able to go through Burgh and Aston Quay… there will be a full closure there. So there will be a full diversion there through College Green. Motorists will be able to move back onto that route at Merchant Quay, she said. You can still travel from north to south across O’Connell Street, but there will be “significant traffic delays“. There will be no access to O’Connell Bridge via Burgh Quay and Aston Quay (ie, you can only turn onto the bridge when travelling north of the River Liffey). The South City Quays at O’Connell Bridge (Aston Quay and Burgh Quay) will be closed to allow for Luas Cross City works with major traffic disruption expected on both sides of the River Liffey. During the night, there will be significant traffic disruptions on the North Quays inbound, on the approach to O’Connell Bridge. A full list of the route closures and disruption can be found here. The works are part of a full road reconstruction. She said the timing was chosen as traffic in the city centre is lowest at this time of year. Because of the resurfacing on Aston Quay and Burgh Quay, Dublin Bus has had to make a few changes to its normal routes. Routes 25, 25a, 25b, 25d, 25x, 26, 66, 66a, 66b, 66x, 67 and 67x. From Pearse Street, buses are diverted via College Green, Dame Street, Lord Edward Street, Christchurch Place, Winetavern Street, left onto Merchant’s Quay and back onto the normal route. Buses will only serve stop 1935 on Lord Edward Street. Routes 37, 39, 39a, 70. From Pearse Street, buses are diverted via College Green, Dame Street, Lord Edward Street, Christchurch Place, Winetavern Street, then left onto Merchant’s Quay and back onto the normal route. Buses will only serve stop 1934 on Dame Street. Routes 51d, 69 and 69x. Buses will depart from stop 4495 on Hawkins Street and operate through College Green, Dame Street, Lord Edward Street, Christchurch Place, then right for Winetavern Street, left onto Merchant’s Quay and back onto the normal route. Buses will only serve stop 1934 on Dame Street. Other Dublin Bus route changes are here. If you will be travelling in or around Dublin City Centre, gardaí advise you to plan your route carefully in advance. They have also warned that people should only drive around the O’Connell Bridge area only when absolutely necessary. Email “Major Dublin city diversions have just come into effect”. Feedback on “Major Dublin city diversions have just come into effect”.